Nothing says "relax" like a luxurious bubble bath. 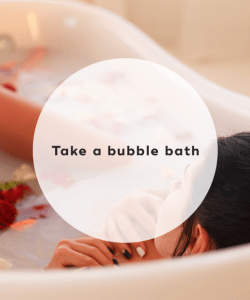 You can surround your bathtub with scented candles, dim the lights, play some soft music, and add some bath salts or bath bombs to your bathwater. While you're destressing in the tub, you can also apply a face mask. Taking regular bubble baths is the ultimate way to unwind after a hard day at work. Professional spa facials can cost upwards of $100. 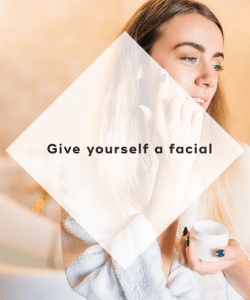 But you can easily give yourself a facial at home for a fraction of the cost. You can create an all natural oatmeal scrub by combining two teaspoons oatmeal, 1 teaspoon baking soda, and water in a bowl until you reach a paste-like consistency. Then apply the mixture to your face, and rub in a gentle circular motion. Rinse well and pat dry. After exfoliating your skin, you can create a luxurious chocolate face mask by mixing together two teaspoons cocoa powder, two teaspoons sour cream, and one teaspoon honey in a bowl. Apply to your face and neck, and leave on for 15 minutes before rinsing with warm water. A restful night's sleep can really help to recharge your batteries, especially after a long work week. Make sure that your Saturday or Sunday mornings are free for you to sleep in. You'll wake up feeling refreshed and ready to start the week again. When you're feeling burned out and stressed, yoga is the perfect exercise to help you feel calmer and more peaceful. The bonus is that you can do yoga in the comfort of your own home. More specifically, restorative yoga benefits your body through gentle poses so that your experience is more healing and recuperative. It's very useful for soothing the mind because restorative yoga uses breathing techniques and contemplation. 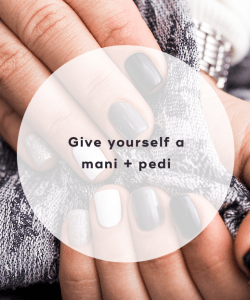 You don't have to go to a nail salon to get a high-quality manicure and pedicure. You can easily give yourself one at home. It's simple. First soak and scrub your feet, hands, and nails. Then soften your cuticles by rubbing them with coconut oil. Gently push back cuticles by using an orange stick. Combine equal amounts of coconut oil and sugar to create a foot scrub. Gently rub your heels and all dry areas using a circular motion, and then rinse well. Before applying nail polish, apply a clear base coat to create an even surface. Paint two layers of your favorite nail polish and finish with a clear top coat. Clean up any nail polish on your skin, and once your nails are completely dry, moisturize your hands and feet with lotion. 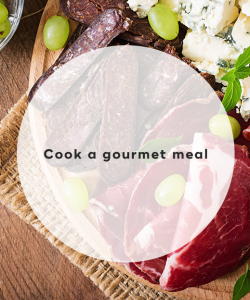 Cooking yourself a delicious, gourmet meal is a great way to pamper yourself, especially if you're a foodie. Browse recipes online until you find a few recipes that pique your interest. Feel free to try out a totally new cuisine or dish you haven't yet cooked. Then set aside some time to purchase the ingredients and cook the meal. As you're cooking, take your time to really enjoy the activity at hand. Once the meal is finally done, try to really enjoy it. Don't be afraid to invite some friends over to indulge! 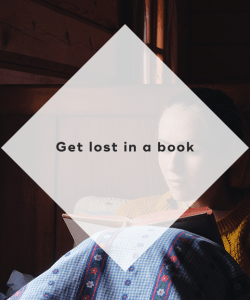 For lots of people, reading a good book helps them unwind and escape the reality of life. Set aside some time to just read for a couple of solid hours in your favorite spot in your living room. You can read a romance novel, blog posts, or magazines. According to research, reading improves brain cognition and function. Drink some tea while you're reading, too! While a professional massage might be one of the best things ever, a self-massage is the next best thing. You can give yourself a neck, back and shoulder massage using an inexpensive self-massaging tool, or you can use your hands. You can self-massage your shoulders and neck by placing two or three fingertips on the back of your neck where your neck and shoulders meet. Then press firmly and hold until the muscles there feel more relaxed. Roll your shoulders forward and back slowly. Easily massage your lower back by using a tennis ball. Place it on the floor, and lie on it so that it's centered in the middle of your back. Move your body slowly up and down and side to side. The tennis ball will be able to massage muscle tightness. Pampering yourself doesn't have to involve spending loads of money. You can easily pamper yourself at home through DIY spa treatments, such as facials, manicures and pedicures, and relaxing bubble baths. Try one of the above suggestions, and you'll instantly feel more rejuvenated. "6 Ways to Pamper Yourself at Home," Melyssa Griffin, n.d.
"15 Cheap Ways to Pamper Yourself," The MDM, n.d.
"8 Simple and Inexpensive Ways to Pamper Yourself," Alternative Daily, April 26, 2016.